#1 of my Top Ten of 2015 – Best Product of 2015! …but wait, before we do, let me reiterate something: This is not simply a massive module, this is a linchpin, a relic finally realized. For as long as I’ve been reading Necromancer Games (and later, Frog God Games-modules), I’ve seen those tantalizing hints, time and again, supplemented by this nasty, trademark “Coming Soon.” Anticipation continued to build up – for years. When FGG was created, published Slumbering Tsar, vastly improved Rappan Athuk and then proceeded to release great book after great book – even saving Razor Coast from oblivion – that’s when I hoped. when the KS hit, I scrounged together all bucks I could, bought two weeks worth of ramen and pledged. And when the KS’ was finished, I sat there – and started honestly dreading the arrival of this book. Why? Because I have the most insane of expectations for this mega-adventure – years upon years of expectations and improved qualities of previous books – since the days of NG, the world has turned. It is my belief that the average of FGG’s oeuvre, quality-wise, significantly exceeds that of NG – NG was the trailblazer, FGG has, at this point, imho surpassed its predecessor. So has Sword of Air changed with it? Is it up to date, or a relic of NG’s days in design-aesthetic? All of this does not bode well – usually, when I have high expectations, I tend to end up disappointed. So far for my own mindset going into this. Genre-wise, Sword of Air is a huge sandbox-adventure that deviates from the player-driven Slumbering Tsar in the key-aspect that it indeed has a metaplot beyond exploration – in fact, this mega-adventure, while providing enough sandboxing, does have a significantly more pronounced plot, is, dare I say, brainier, than most modules of this size. It should also be noted that the modules vast array of maps, all in gorgeous full-color, come with player-friendly versions and my dead-tree copy featured a high-quality, gorgeous hex-map of the areas covered herein. Indeed, the Gulf of Akados-region as depicted herein, with hex upon hex of things, settlements, dungeons is ridiculously detailed and provides more storylines than I can hope to cover in a review – there is so much material here, you will NOT be wanting for simple material to put your PCs through. Indeed, much like the most detailed settings of old, you can just put this book down as a kind of massive world-guide, push your PCs in and there you go -even with this type of gameplay, ignoring the plotline, this probably has enough gaming material to last you at least a year. So yes, you can wide-open sandbox this beast…but you don’t have to. All right, enough procrastination – this being an adventure-review, from here on out reign the SPOILERS. Potential players should jump to the conclusion. If you’re a player, jump ahead – or Tsathogga AND Orcus may well descend on you and consume your soul! All right, only GMs left? Great! First of all: This mega-adventure has one of the most surprising primary antagonists you’ll ever see – unless your players are exceedingly paranoid, to the point they even exceed the paranoia of mine, they will NOT see the revelation of the true mastermind coming -and indeed, a lot hangs in the balance here. This book is an epic quest that spans multiple artifacts, with, obviously, the Sword of Air taking a central role. The PCs are drawn into this epic via the feud of two archwizards Kayden and Sorten, who face an issue of mutually-assured destruction – a theme that has an intriguing resonance in the subtext of the module that sets Sword of Air, intentionally or not, apart – and yes, I used the word “epic” in the truly intended context with all the ramifications of this word: Sword of Air puts A LOT at stake, and all in the player’s hands – with a distinct chance that the PCs and players may unwittingly unleash doom upon all of the Lost Lands. The stakes, though it may seem otherwise, are apocalyptic indeed. While the general notion is that the PCs are recruited by the…let’s say, less than nice wizard Kayden to get him the Shagaspondium, a legendary item and the first trail towards the Sword of Air, this mega-adventure very much has more for you to do than you can ever want – strange ruins dot the landscape. Dragon-families with funny names engage in an ancient family feud. Vampire princesses lie entombed in small dungeons. A lycanthropic gnoll-lord rules over their people in a massive mountain-fortress – all of these come fully mapped and yes, certain forests contain dark secrets at their center – and the domains of the two arch-wizards, with their excessive details, also should be considered intriguing. The production-values have to be mentioned here – this book has A LOT of artwork and cartography – many of which can be considered stunning. The full-color renditions, especially of mechanisms and areas (less so for characters) are absolutely awesome and help immersion immensely. Speaking of which – the level of detail, should you prefer simulationalist approach, includes handy lists of food-consumption and areas containing a lot of NPCs, you’ll enjoy the schedules that depicts when character xyz is here and when not. It should also be noted that the NPC-builds are a tad more creative and versatile than in most FGG-books, with plenty of multiclassing and archetyping. Speaking of Aka Bakar’s tomb- the dungeon is deadly, but you knew that much, right? Fact is, it’s also, much like the basic plotline, a place where brains are just as required as brawns – the numerous, smart puzzles provided within this massive complex provide a great change of pace from the deadly adversaries, unique foes and lethal traps – and yes, there are some traps herein that will TPK foolish groups – much like Rappan Athuk and similarly challenging modules, this is NOT playing around…though, at least in my opinion, the whole complex adheres to an internal consistency beyond what e.g. RA delivers – the complex not only felt thoroughly unique and alive, it simply is awesome and feels organic, logical. But what to do with the Sword of Air, should the PCs recover it? One thing is clear – this sword in the stone has brought untold suffering and needs to be taken care of – but how to destroy it? Well, this is where the massive book essentially splits its direction – unless you direct things otherwise, of course. Researching the means of destruction, unlike with most artifacts, can yield two options – but that may not be apparent for the PCs. The most rewarding option may be to send them in the direction of method A) and then have them realize that something is amiss. If only, because missing out on even a bit of the Wasteland of Tsen would be a crime in my book. Do you recall my incessant gushing about Slumbering Tsar’s Desolation back in the day? Well, at this point, the Wasteland of Tsen, horribly irradiated and providing tables upon tables of mutations, constitutes perhaps one of my favorite areas ever depicted in a fantasy roleplaying game. Utterly unique and strange, with ample of deadly creatures, this desolate place with its delightfully tentacled squirrel-swarms and unique hazards and creatures hides more than the remnants of a fantastical fallout – essentially, from the temple hidden beneath the dead lake to the massive, ruined city, this gigantic, impressively-detailed exploration takes the former awesome components and one-ups them in imagery and iconic themes – and below do lie the lead mines of Tsen, where maddened clerics of Arden defend the Heart of their dead god – and with it, one of the options to destroy the doom-bringing Sword of Air once and for all. The other option, of course, involves researching the existence of a legendary beast of Tarrasque-like proportions (and a CR of 27) that happens to be immortal. No, this is not the highest level CR the PCs can stumble into – one endgame-scenario can be summed as literally “The world is doomed.” Now matter how you play this gigantic beast – no matter, how things turn out – getting through this in any way is a feat – a true achievement. I am waging a gamble: This will surpass Rappan Athuk at one point in its legend. Why? Because its storyline is compelling and because it does engage the brains and all problem-solving skills of a group beyond what most modules dare to do – from opposite-battles to research and schemes within schemes to the ridiculously awesome locations, this book is stunning. And since I can’t really properly convey that – this book contains almost 100 pages of maps. No, I am NOT kidding. Each and every little halfway feasible locale is mapped. This is beyond concise and extensive. And yes, as always, we get copious monsters and magic items and, and , and – but ultimately, everything pales before this module. And yes, I will remain this opaque here – you should get this and read it yourself. I can’t properly convey this book’s impact. Editing and formatting are top-notch – for a book of this size to have this level of cohesion is more than just remarkable – it’s a feat in itself. Layout…oh boy – this book is gorgeous full color, glossy paper and sports absolutely stunning, video-game artbook-level beautiful illustrations…a lot of them. Contrasted with this level of realism and beauty are callbacks to old-school artworks, mainly represented in the character-artworks that depict those guys – personally, I didn’t like the comic- style employed in some of them, but that is a matter of taste. I just wished they had adhered to the style depicted in the landscape-shots – why? Because both the book and the artwork conspire to evoke a unique atmosphere. More on that below. The pdf comes fully bookmarked with nested bookmarks and my hardcover is gorgeously stitch-bound with the level of quality I’ve come to expect from FGG. This is, in my opinion, all that is great about old-school gaming. Much like games like Demon’s Souls or Dark Souls, this plunges you into a world, where wonder, death and danger lurk at every corner – where strange things abound. Much like Slumbering Tsar, this evokes a sense of an ancient world that has moved on, a massive, storied place that has always existed – where each hill may hide new questions, new answers. Indeed, for the first time since Tsar, I felt reminded of why I truly adored this gritty style – the comparison that comes to mind, is the honorable Judge’s Guild, the Wilderness of High Fantasy. This is, what frankly only a book of this size could conceivably offer – a simulation. A massive simulation of a huge region that is organic, filled to the brim with awesome adventure, weirdness, Easter-eggs…all without delving into the ridiculous. Yes, you may find a purple demon-cow…but you may also unearth some strange ruins, find truly unique creatures or even test your mettle against a god long-thought dead. Sword of Air is hard – but not because of it being unfair. Yes, you will need to run and yes, sometimes, the characters will die…but the true accomplishment of this book is that it sports a central narrative for the GM to use to get things on track. Essentially, this could be considered a synthesis of the massive strengths of Slumbering Tsar, coupled with a central plot-line that is more consistent than its brethren. What brethren am I talking about? Well, obviously the classic sagas that revolved around a certain axe that lords of the stout folk used to wield and, more fittingly, perhaps – the Rod of the 7 Parts. Sword of Air mops the floor with them and takes their lunch-money, while beating Rappan Athuk up with its free hand. This gigantic masterpiece is more evocative than all of those, is challenging and clever – it dares to demand smart and attentive players. It dabbles in the weird and uncommon. It has an utterly unique adversary, sports some of the most iconic locales available in this generation of modules and does all of that while maintaining its focus, its leitmotif and putting literally all choice within the hands of the experienced GM – where, ultimately, that belongs. Don’t get me wrong – I love APs and their tight stories, but this is something different – this is a way of forging your own story, with options galore to insert whatever modules you’re itching to run. Unlike a regular AP, this is pretty much a world-immersion-experience in a sense one only rarely sees – because it is extremely hard to pull off. In the hands of even only a good writer, cohesion is lost and the settlement of amazons feels out of place, everything dissolves. Well, Bill Webb is anything but “only good” – this Magnum Opus is perhaps the ultimate proof of his vast imaginative potential. 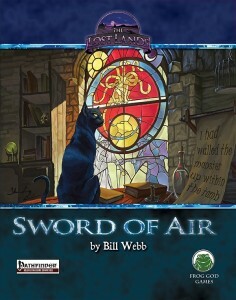 Sword of Air is an absolute masterpiece and even among Bill Webb’s extensive canon of superb modules, it stands out at one step beyond, further enhanced by the FGG crew going the extra mile regarding the sheer number of foes and the increased optimization of builds of foes. Add to that the vast amount of art and cartography and we have, quite frankly, a book for the ages. There is something very wrong with the world if this does not become a truly legendary book, a milestone – Sword of Air is quite frankly a book that only happens every couple of years, one that is so good, so fun, so unique, I’m running out of superlatives – fast. If a new generation of gamers wants to know why those grognard’s eyes glaze over when the classics are mentioned, when you never really got what is supposed to be great about something like Rappan Athuk – then this book is for you. Because more so than RA, it represents what is best about this type of gaming. It challenges the mind, it inspires, it is unbound and wild and free and epic beyond what a lesser tome could hope to achieve. In case my gushing diatribes were not ample clue – the only book in the current generation of modules that comes close to this in scope and quality of atmosphere would be Slumbering Tsar – and, personally, I actually like Sword of Air a bit more, if only because it is a tad bit more focused and has the benefit of the narrative being there to guide the PCs back on trek if they get lost in the sandboxing. I firmly believe that this book is a must-own book that belongs into the library of any DM looking for a challenge, looking to understand what a truly free, and yet intelligent and focused sandbox can be. Sword of Air is a masterpiece, gets 5 stars + seal of approval and is, obviously, a candidate for the number 1-slot of my Top Ten of 2015. This mega-adventure does everything right. Get it and never let go – this will be a classic in the generations to come; to me, it already is one. 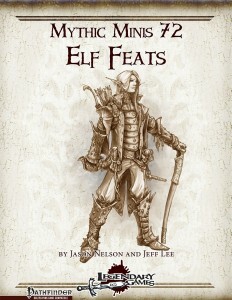 You can get this legendary tome here on OBS and here on d20pfsrd.com’s shop! Do you prefer S&W’s old-school rules? You can get this version here on OBS and here on d20pfsrd.com’s shop! I post this review in the last hours of FGG’s latest massive super-book: The Northlands Saga. Take a look here, if you haven’t already! The first supplement released by Rusted Iron Games clocks in at 5 pages, 1 page front cover, 1/2 page of SRD, leaving us with 3.5 pages of content, so let’s take a look! 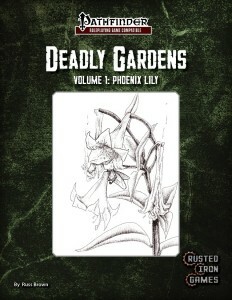 The Deadly Gardens-series obviously depicts uncommon plant creatures at an affordable price – the creature herein being the Phoenix Lily – but before we dive into that one, I should mention the two magic items provided in the beginning, the first of which elicited a “D’OH, why didn’t I think of it?”-response – the Specimen Jar allows you to collect sample, which then remain fresh – whether it’s volatile, fast decaying material of the foes you research, seeds of odd plants or something different. Nice one! The second one, the Fecund Totem, greatly increases plant-growth and even enhances plant-creatures – the presence of such an item may provide an interesting tactical component to a given fight – or act as a quest item to combat a particularly nasty blight. The creature – well, Phoenix Lilys clock in at CR 4 – and generally, are interesting: The plants can emit devastating scorching rays and have an inherent resistance to fire, one, which, when surpassed, may result in the plant exploding. The creature is nice, fun and comes with a gorgeous b/w-pencil-drawn artwork I did not expect from such an inexpensive, short pdf. The supplement does not end here, though -instead, we get a short primer on harvesting natural items – including, obviously, the phoenix lily’s volatile blossoms as well as fire beetle glands, basilisk blood and shambler wafers. I thoroughly enjoy this take on harvesting monsters etc. – I’ve been basing my main campaign’s whole crafting system around the harvesting of the like – so yeah, awesome, particularly now that the presentation has been further streamlined. Even cooler, the pdf takes Basilisk’s Blood and Phoenix Blossoms and codifies them as power components – with different effects for various spells, whether if used as focus or material component – a phoenix blossom used with burning hands, for example, renders the spell’s area of effect a 20-ft.-line. This is intriguing and supplements the notion of the magical world well – kudos! Editing and formatting are top-notch, I noticed no glitches. Layout adheres to a nice, printer-friendly two-column full-color-standard and the pdf now is fully bookmarked. The pdf’s artwork is gorgeous and deserving of praise, especially considering the low price point. Russ Brown’s first offering is a pretty impressive one – this small pdf provides an interesting adversary, some nice botany-themed option and goes a step beyond what would be required regarding the immersion-enhancing aspects of rooting (haha) a creature within the world by tying it into items, magic, etc. For the low asking price, this is a fun, neat supplement that makes me look forward to the next supplements. My final verdict will clock in at 5 stars + seal of approval. You can get this inexpensive supplement here on OBS and here on d20pfsrd.com’s shop! Daenyr has been gone for more than 3000 years – the nasty vampire’s erstwhile temple of darkness has fallen to ruin and all’d be well. Until a cult of deranged vampires and cultists have re-entered the temple and begun engaging in their dread rites – so, it’s mop-up time! Surprisingly, the hyperlinked statblocks do sport a nice modification for a fallen holy warrior and Daenyr himself – so yes, it’s time to end these undead once and for all. 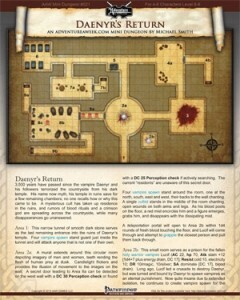 Michael Smith’s Daenyr’s Return is a solid mini-dungeon with a tight leitmotif: Anti-vampire-crawl. The dungeon itself is nice and the challenges provided solid – especially nasty teleportation-traps with grapple etc. can be rather unpleasant and danger-wise, this is nice. At the same time, I found myself longing for a more unique terrain trick or set-up. This is not bad by any means, but neither did it blow me out of the water. My final verdict hence will clock in at 3.5 stars, rounded up to 4 due to in dubio pro reo for the purpose of this platform. This installment of Raging Swan Press’ glorious Town Backdrop-series clocks in at 29 pages, 1 page front cover, 1 page advertisement, 1 page editorial, 1 page ToC, 1 page author bios (including a handy list of stats by CR), 1 page SRD, 1 page back cover, leaving us with 22 pages of content, so let’s take a look! We begin this book not with the town, like you’d expect – instead, we are introduced to a gazetteer of the surrounding region of Wolfbane Hollow: Fro Ashenblade Forest to the Dankwood, this pdf provides an interesting example from the get-go -namely that you *can* write multiple, inspiring short descriptions of forests and, with the wonders of properly chosen nomenclature, evoke a sense of wonder from the get-go, one btw. supplemented further by the nice b/w-map included for the region. And yes, one of my favorite villages in this series’ smaller brethren-series, the iconic locale of Hjalward, can be found in the vicinity, allowing for a nice sense of narrative cohesion, if so desired. And yes, I’d really like to see the Greatshadow Gorge, where the Orlo-gutang flows… So yes, much like the Lonely Coast back in the day, this brief gazetteer made me immediately long for more. The town of Wolfsbane Hollow is not a nice place – a danger-rating of 15, the cursed condition – even a cursory glance at the provided statblock immediately makes sure that yes, there is sufficient material for adventurers to cover. 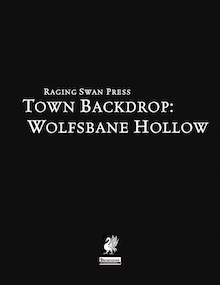 And indeed, the town lore provided does mention, beyond the proximity of the hordelands, the dread Redclaw Reaper, a werewolf serial killer, whose shadow still casts a pall on the town. At the convenience of GMs, not only are notable locations depicted, but a concise list by category also immediately provides just what you require. Beyond the information of magic items for sale in the marketplace, we also learn about local fashion, native ethnicity and nomenclature. The town, with its neat b/w-cartography, can also be relatively easily incorporated into your game, with plentiful advice on customization being provided. A fluff-only GM-cheat-sheet that lists all movers and shakers of the town on one handy page further eases the use of Wolfsbane’s Hollow. Following the tradition of this series, we also enjoy a rather pronounced array of 50 whispers and rumors – but whether the rumor that the sun-goddess has cursed the town for burning the Redclaw Reaper…and her cathedral to the ground…I will not tell. The life of the town is governed by the river, but beyond this information, local color galore renders immersion into the streets of this town easy – with sample festivals mentioned and information on law enforcement, Raging Swan Press’s trademark attention to detail makes the town come to life – and beyond the general pieces of information provided, a full table of 50 events and things provide further detail, further hooks – you can, literally, just queue these and look where things are going. If your players are in any way like mine, they will take an interest and there we go -adventure! Now, I have forgotten to mention yet another massive table provided herein – no less than 50 sights and sounds complement your descriptions of the life in the town, allowing you to paint with a variety of colors on the canvas of emotions – unlike many thematically-fixed locales that have a distinct, easily identifiable leitmotif and thus become predictable to the discerning gamer, the diversity here provides an intriguing array of moods. From the horrific to the beautiful, there is a nice amount of oscillation going on, with the subtle effect of rendering this town a surprisingly vivid experience to play in. And yes, if you’re afraid that there is not enough divergence from a pseudo-medieval background, well then looking at the geographic situation and the hints of the empire of Arvollis here, still alive in some linguistic relics, and you’ll still get a sense of otherness, of exploration: The erstwhile conquerors are still here, after all – and the secret, true history behind the failed inquisitions and the wars against the indigenous werewolves that once haunted these lands makes for a smart read, but not one I’ll repeat in this review. Beyond these, brief write-ups on the somewhat elemental-themed 5 locally-worshipped deities are provided before we dive into the meat of the town, into the detailed description of the points of interest. From the one-handed, depressed netter who may have an insight into the truth of the town’s shadowy underbelly to taverns with noted prices for accommodations and rooms, there is a lot to see. Why not, for example, visit the Foxhound and see the Red Reaper’s blackened skull mounted over the wooden hearth and convince yourselves that all is fine? With agents of the hordelands (ones you would NOT expect) in town and a shadowy guild stalking the streets, Wolfsbane Hollow is definitely in need of adventurers. And yes, in case the name was not ample clue – here there be werewolves. Editing and formatting are top-notch, I noticed no glitches. Layout adheres to Raging Swan Press’ elegant two-column b/w-standard and the pdf sports numerous thematically-fitting b/w-artworks. Cartography is nice as well and the town does come in two versions – one optimized for screen-use and one optimized for your printer. Kudos for this. Oh, and yes, they are extensively bookmarked. Robert Brookes knows how to write a town that feels unique, that feels alive – and he succeeds in this town to an extent I would not have expected. Indeed, the rather obvious name did not elicit too much excitement from yours truly, but the sheer amount of adventuring potential within this town is rather impressive indeed – whether by internal or external threats, by conspiracy or blatant conflict – there is a lot to be found and done and taking an interest in the people comes with its rewards. Wolfsbane Hollow is very much a wolf-in-sheep’s-clothing in that regard – it looks harmless, but is not a place for the faint of heart. Add to that Julian Neale’s touches in statblocks et. al and we have a town that indeed can be considered a more than worthwhile buy. I, for one, look very much forward to sending my PCs to Wolfsbane Hollow – and then lean back and wait what happens, what strikes their fancy. Few settlements manage this depth without succumbing to the issue of going for the one big threat, the one prevalent leitmotif – this does achieve just that. Hence, my final verdict will clock in at 5 stars + seal of approval. You can get this cool backdrop here on OBS and here on d20pfsrd.com’s shop! This is essentially a combined campaign setting and rules-overlay that allows you to create a superhero-style cyberpunk game via Pathfinder – the rules I’ve seen so far are solid and Mike Myler’s playfulness is an interesting deviation from the usual trope of the gritty cyberpunk aesthetics – though this will allow you to go Shadowrun via Pathfinder, should you choose to do so. Hypercorps still has 7 days to go, so take a look! You can check this out here! The first installments of Northlands Saga have been a blast for me. Why? Because, for the first time in ages, I actually saw modules there that *GOT* Viking adventures. You see, I have a degree in Scandinavian literature and culture – I’m fluent in quite a few languages and they include Norse. I know a lot about culture, aesthetics and morality – and almost everyone gets it wrong. There quite frankly may be quite a few fantasy modules set against a viking backdrop – but they do not *get* the culture. The different concepts of what’s right and what’s wrong, the morality that is not based on a direct dichotomy between good and evil, much less what constitutes acceptable behavior and what doesn’t. Kennings, dróttkvæði and similar concepts…well, let’s not start with them. Frog God Games’ Northlands Saga got that right – and whe no new modules were released, just as the series one-upped itself time and again, I was kind of sad. Now, it’s completed and back – in a massive Slumbering Tsar-level hardcover of epic proportions and I knew that this would be where my birthday’s money would go. I believe in this book – it’s massive, unique and huge and I sincerely believe, that with Kenneth Spencer and legend Greg A. Vaughan at the helm, this will crash the shores of bookshelves with the impact of a thousand dragon-ships. I whole heartedly endorse this massive book! The KS only runs for 3 more days, so please check it out here! Interjection Games’ Bradley Crouch’s patreon for custom classes and supplements can be found here! Raging Swan Press subscription/patreon can be found here! Purple Duck Games’ Monsters of Porphyra II patreon is here! The Little Red Goblin Games patreon can be found here! You can support Rite Publishing’s free e-zine Pathways here! Roleplaying games author Rich Howard’s patreon would be here! J.M.. Perkins has a unique setting in the works here! Jacob Blackmon, artist extraordinaire, has his patreon here! Ben McFarland’s patreon would be right here! If your gaming-related patreon or KS is not here and think it should be, please tell me so! Finally, I’d of course appreciate it, if you found my reviews helpful in any way, if you could take a look at my own patreon. Only due to the support of generous patreons can I continue providing all these reviews. This massive book clocks in at 312 pages, not including the covers. Of these pages, 1 is reserved for notes, 1 for the editorial, 1 for the ToC and two for the SRD, leaving us with o less than 307 pages of content, so let’s take a look! But before we dive into the matter at hand, let us first define what this book actually is – a kind of celebration of a series that was nicked in its bloom due to various reasons – I’m, of course, talking about “Demons & Devils” and “Vampires & Liches”, the two module compilations released back in the day by Necromancer Games for 3:X. In case you haven’t been around back then to check them out, the premise was simple: Provide old-school modules that are HARD. Not regular FGG-level hard, but…well, nasty. Diabolical. Obviously, I was all for this and coincidentally, “Demons & Devils” was one of the first three books by NG I purchased back in the day at my local FLGS. I was at the same time exhilarated and dreaded the arrival of this book – I knew that there were more modules planned that never saw the light of day, but would they live up to the legend of their predecessors? Would the new versions work? Before I present the modules, let me share some observations with you: For one, fans of FGG’s Lost Lands will cherish suggestions of where to place the modules in the context of the campaign world. Beyond that, the modules sport copious new artworks of rather neat quality, so there’s that. At the same time, I think one can pretty easily discern the modules that hearken back to the Necromancer Games-era. I may, obviously, be mistaken and only goaded on by some minor relics that refer to NG instead of FGG, but I believe that a certain sense of growth can be seen by quite some authors herein. The conversion-work, generally, is pretty good – when e.g. vehicles are included and ACG-rules are used here and there, one can see that not only the bare minimum was done. At the same time, I do believe that the conversion could have done a slightly better job in some instances, but let’s talk about this when it does rear its head. The modules are grouped by 3s, with each segment having a certain creature-theme. It should also be noted that the modules do sport less hand-holding than many contemporary modules – experienced GMs are definitely going to have an easier time here, with so modules being more challenging (but also more rewarding) than others. Well, let’s not dilly-dally any longer and take a look! This being a review of a massive adventure compilation, the following contains SPOILERS. Potential players should jump to the conclusion. The first module herein would be J. Collura’s “Noble Rot”, intended for levels 5 -8. In this module, the PCs explore the dilapidated, decayed wine-making operation of the erstwhile prolific Gluant family, hoping to loot some of their exquisite wines. From a significant array of rumors, one can already piece together some intriguing notes about the family – and indeed, the exploration of their dread grounds proves to be a most exciting task – with the undead roaming and a sense of decay pervading the grounds, one can quickly glean that not all is well: Indeed, the family has fallen to the power-struggle of two dread demon lords associated with fungi and slime and thus, the exploration proves to be somewhat icky. Highlights of this module include definitely the author’s obviously well-done research that makes the place feel organic and realistic, the new wine slime, wine-making-themed hazards (which benefit quite a bit from the GM doing a quick research for them – I found depicting them easier thereafter) and two particularly challenging encounters – the final battle and the penultimate one both are nasty and reward smart players for drawing the right conclusions in a way more often seen in CoC-pulp-modules than in fantasy – nice! It should also be noted that the titular Noble Rot, based on the real world fungus Boytris Cinerea, can be contracted as a symbiotic fungus that actually acts as a bonus and which allows the GM to help in case of abysmal PC luck. While I believe this is better suited at 5th level than 8th, this module is a strong opener that definitely deserves accolades for the consistent and tight atmosphere evoked. “Of Ants and Men”, for PCs level 4 – 8, is written by Bill Webb. Do I really need to say more? All right, the short version is that the master of Frog God Games delivers by the spades in one of the most simple, yet unique and challenging crawls I’ve read in quite some time. The premise is simple: Get Giant Ant eggs out of the hive. Easy, right? WRONG. For one, as the dead adventurers attest, there are more issues looming – and the hive is interesting. Instead of devising a convoluted mechanic to depict the hive, we instead get different alarm-statuses for the hive and an easy means of determining initiated aggression upon intruders – essentially, PCs can be sprayed with pheromones by engaging in combat – this results in “aggroing” the hive. Conversely, smart groups that infiltrate the place, steer clear of the warriors etc. may actually make their way to the intelligent queen of the hive – where they may conduct negotiations via pantomime with the mistress of the place. Following the notion of a Gygaxian simulationist world, incursions into the hive by other creatures provide opportunities for the PCs to be sprayed with “friendly” pheromones, facilitating their infiltration. Oh, and AoE-effect can crumble the tunnels. Cave-ins are NOT fun, so your PCs better be smart. As a nice twist a GM may include or leave out, the hive has burrowed into an antediluvian complex, where extremely deadly traps await alongside a mundane blade made from magic-nulling material – obviously, escaping with this nasty, priceless weapon can be rather tough…and may lead to very intriguing further capers. I LOVED this module – it’s unconventional, fun, rewards clever players and could be played as a war of attrition, an infiltration of just a hack-n-slay-type of module. Glorious! Speaking of which – what’s better than a module by Bill Webb? What about one where Matt Finch co-authors the thing? “Hidden Oasis – Temple of Thoth”, intended for levels 7 – 9 is ridiculously awesome: When a mysterious stranger, a djinn in disguise, offers knowledge in exchange for a task and produces a strange papyrus scroll with symbols, we kick things into high gear – for the PCs leave their bodies for the plane of shadows, where the equivalent of a Star Gate can be activated with the runes handed to them, bringing them to a kind of odd demi-plane-ish Oasis. Here, an exploration of the ruins and surroundings does show that something has befallen the mysterious planar nexus that is the temple of Thoth. Clever research may also help here, for indeed, the sealed temple that can be accessed via another gate here has been infected with the Waxen plague, a dread affliction that either kills those subjected or turns them into gelatinous cubes – but thankfully, the high-priest is still around, holding the fort. Surely, the PCs can help him…oh wait. The spiteful djinn may have forgotten to mention that the high-priest is a huge, intelligent transparent slug with a humanoid brain in the torso. Yep, that’s the good guy. Oh, and he can control the priests-turned-cubes, in case you’re wondering. Exploring the temple can net the PCs access to some teleportals, but that’s not the problem – the temple is about to be compromised by a dread force of Planeshoppers. What are these guys? Pretty deadly, locust-like conquerors that seek a waypoint into the PC’s world! Worse, they are about to come full force and the synergy effects of their castes render them formidable foes. In fact, their builds are significantly more interesting than I’ve come to expect from FGG – they are deadly and use some very advanced tricks I really like. With lethal psychic shokwaves predating the invasion, the PCs do not have much time – but there is one ace in the hole: The Scorpion of Sekhmet. If the PCs have been smart, they’ll have found some mysterious power-sources – which the can use to power a gigantic SCORPION-MECH, Power Rangers-style. I.e. multiple PCs have to pilot this bad boy, with actions eating at the power source, movement and turning adhering to concise and easily understood rules…oh, and tail-laser. This is absolutely awesome in so many ways – can you remember when you last fought alongside a giant transparent slug-priest and his gelatinous cube henchmen in a giant scorpion-mech against massive, deadly and evil insectoid invaders hell-bent on subjugating your world? Thought so! This is one of the best modules herein and absolutely glorious! Demons and Devils are next, all penned by the legendary duo of Clark Peterson and Bill Webb. The “Sorceror’s Citadel”(suggested level: 9) is pretty much a straight-forward dungeon-crawl into the abode of a wizard named Crane, known for his mastery of a sphere of annihilation and subsequently eliminated in battle against foes most vile – and infiltrating the place is challenging – the use of magic in particular, with clever illusions etc., renders this a classic challenge. “Ra’s Evil Grin,” so named due to the puzzle required to enter the meat of the module, also provides a quest for an artifact, this time, for the Globe of Arden – but to reach it, the PCs will have to brave a dungeon that has one of the nastiest traps in FGG-history (Yes, on par with the legendary entry to Rappan Athuk) and yes, the maze and foes are intriguing. If you’re looking for something different: I ran this as a solo-module back in my old campaign (only suggested if you’re *really* sadistic and your players know that death awaits…) and made the whole dungeon times, making the mummy priest and immortal, regenerating badass that hunted the poor PC through the dungeon. And yes, my PC solo’d the demon at the end in an extremely close encounter, but still. That being said, most GROUPS probably will have a VERY hard time surviving this beauty – one of the classics and so sweet indeed… I just wished the web-enhancement of the journey to the island had been included and updated herein. The third module herein would be my least favorite among the old modules from “Demons & Devils” – it is essentially a two-parter, with the first one centering on a paladin getting a holy avenger. Thereafter the dread deceit of the demons becomes apparent, as the blade corrupts the champion – the true blade still lies hidden and, in the end, one has to be chosen. I’m not a fan of alignment and even less s a fan of forced alignment changes, so while not bad or necessarily problematic, I always considered plots like this to be something of a cheap shot. Rules for lesser versions of the classic demons have btw. been included in the deal here. Okay, the next triumvirate would be “Giants & Dragons”, which kicks off with Michael Curtis’ “The Dead from Above,” intended for levels 10 – 13. And oh boy, does it kick off! SPLINTER!!! CRASH! FIRE!!! DEATH!!! Undead giants fall on the town and lurch to life, while a dragon skeleton swoops through the air and a gigantic building fashioned from titanic bones hangs in the sky. Defeating the initial onslaught, PCs can actually RIDE the skeletal dragon (!!!) up to the fortress and bring the fight to the nasty giants – who have fused one of their kind with the flying fortress, dooming the pilot to a body-horror-level nasty existence. Taking down the giant’s flying fortress and crashing its soul-consuming engines is absolutely AWESOME. This is unrepentant in its glorious ideas, with truly deadly adversaries and a set-up that will leave any metal-head (or boy…or gamer, really…) squeeing. Come on. You ride a skeletal dragon to a fortress in the sky to do battle with necromancer-giants. This does everything right that “Curse of the Riven Sky” did wrong -it embraces its over-the-top OMG-what-is-happening-premise, has glorious terrain and even means for social manipulation…oh, and, of course a reason why PCs (probably) shouldn’t keep the fortress. AWESOME! Where the above module was pretty much straight action, James M. Ward’s Dead Dragon temple, for PCs level 6 – 8, instead opts for portraying the majestic – at the side of one of the most difficult to scale mountains I’ve ever seen represented in a module, lies a dragon-shaped temple, wherein the spirits of dead dragons roam as haunts, while hostile adventurers and lizardfolk cater to their whims – fulfilling the desires of the reptiles can lead to different rewards and sidetreks, should you so choose, and the temple does contain a unique, good white dragon as well as a means to defeating a truly deadly menace – for the PCs venture inside to become dragons to stop an ancient blue dragon from destroying more settlements. The final draconic dogfight is a joy, but only if your GM-prowess is at expert level: Handling a group of dragons in the air is difficult and I’d strongly suggest getting the legendary “Companions of the Firmament“-supplement for the rules on 3d-combats, turning, etc. – with them, this is a huge blast. Without them, you’ll have to be pretty adept. The third module is penned by industry-legend Ed Greenwood and it does show: “Emeralds of Highfang”, suggested for 15th – 17th level, is a difficult module, themed, obviously, around giants and dragons. While the hooks are somewhat lame, exploring the complex, where giants mine at the behest of a deadly dragon, who uncharacteristically is more of an underground merchant, can actually be rather exciting. On the plus-side, Ed Greenwood’s attention to detail is superb and the respective areas do feel alive and intriguing. At the same time, I do feel that this module does fall a bit flat of its premise, which supposedly is to provide enough for rogues to do and for smart groups to do via stealth – at the suggested levels, the PCs, at least mine, will curb-stomp the hell out of all opposition herein but the final dragon. On a nitpicky note – a rather cool trap unleashes 240 Stirges – which are utterly impotent against PCs of this level. Why not utilize the troop-subtype (or a variant swarm) and make this a challenging encounter, instead of an annoying one? Generally, a solid module, but short of the previous ones. Lycanthropes and Elementals would be up next, starting with Steve Winter’s “Bad Moon Rising” for PCs level 6 – 8. If the title was not ample clue – set in the Barony of Loup-Montagne, the superstitious locals, wolves in the woods and similar set-ups make one thing clear: We’re in gothic horror country here -this module could have been run in Ravenloft with only minor changes. The plotline, which includes sufficient red herrings, a bid for succession and a potentially doomed family, hits all the classic notes – for better and for worse. The module itself is pretty sandboxy and thus requires some GM chops, though admittedly, not too many. The twist itself, the culprit, was something my PCs saw coming in spite of the various red herrings – perhaps due to years of Ravenloft-experience. It’s a solid version of a classic story-not more, not less. I got the most mileage out of this by combining it with Raging Swan Press’ Wolfsbane Hollow, combining both plotlines into something less obvious, while retaining thematic integrity. Skip William’s “Death in Dyrgalas” is a pretty straightforward dungeon-exploration of a ruined pavilion, which does not specify its intended level – from the CRs, I’d suggest something along the lines of level 5 – 8, depending on your PC’s power. The exploration itself pits the PCs versus wererats and weretigers and a highlight definitely is the interaction with a medusa. The module’s appeal mostly stems from the interesting surroundings – other than that, this is solid, if somewhat unremarkable. Michael Curtis’ next module would be “The Darkening of Namjan Forest” for PCs level 6 – 8. Said forest is slowly, but surely becoming coterminous with the Plane of Shadows and to stop this, the PCs have to find and disable a dangerous artifact within the depths of this forest. The hexed map of the forest allows for an easy tracking of the progress of the darkening and the continuously draining effects of the darkening provided serves as an intriguing backdrop with rules-relevant repercussions. Via special quartz, the PCs may get themselves an edge versus the predominantly draining creatures herein – there are A LOT of shadows and similar creatures in this module, so depending on your PC’s preparation and classes, the difficulty of this module may fluctuate somewhat. I really enjoyed the general premise and set-up of this one, the impending doom and the continuous representation of the ticking of the clock provided by the encroaching darkness. However, alas, there are some issues among the details herein – from sensory-deprivation tanks and similar magical apparatuses, there are quite some unique benefits to be gained here – and their rules-language is horribly opaque, rendering them VERY over-powered. I strongly urge a GM to take care before allowing the PCs to utilize these. In fact, I think they should be nerfed and/or replaced. This, though, constitutes the most negative thing about this module – the new creatures and the adversary are interesting and, in the hands of a GM willing to sand off the rough edges, this definitely is a very fun experience. The next three modules have the theme of Men & Monstrosities, with James M. Ward’s “Deep in the Vale” as a 1st level module being the first. The set-up is interesting in a way – the PCs are plain folks of the Vale, everyday people, and the module begins promising, with the Thor-ordained sporty trek around the vale that inevitably results in trouble. The module, obviously, tries to chronicle the step from everyday-Joe/Jane to hero and the tidbits on culture provided are intriguing. But this, as much as I’m loathe to say it, is one of the worst modules FGG has ever released. If I didn’t know any better, I wouldn’t expect Mr. Ward’s pen at work here. Let me elaborate: The premise, is unique and hasn’t been done much recently, but it suffers from this being an adventure – to properly invest the players in the setting a closer gazetteer, nomenclature, suggested roles and origins for casting talent – all of that should have been covered. They’re not. Worse, everything here is a) clichéd and b) a non-threat in the great whole of things. You see, there are essentially two catchers – a DM-PC, the horribly-named elf Smaragdus and if things get too heated, there’s a wizard who can fireball everything to smithereens. I.e., the PCs and all their struggles essentially boil down to those two pricks not getting the job done/being lazy – it’s the old issue of the Forgotten Realms, where some areas just had too many high-level NPCs for the PCs to matter. “Elminster is not available, please class later.” Worse, the wizard herein does not have Elminster’s realms-spanning responsibilities, so he has no reason not to ge his grip together and totter with the PCs to the woods. The adversaries are also horribly trite – wolves, goblins, orcs, giant spiders. And yes, the orcs come with an ogre. Only the shadow is missing from the clichés of boring low-level foes. We have a kidnapped damsel that is so obvious, I only expected the Timmy-character to show up next. Beyond that, the module falls prey to hackneyed logic – why does prodding the giant spider nets not endanger the folk outside? Shouldn’t heroes NOT endanger commoners? Why do the responses of the goblins, which look like taken from a choose-your-adventure-novel, make no concise sense from the goblin’s perspective? Why does the non-read-aloud text AND the read-aloud text TELL the players what exactly they’re doing if they choose A)? This is railroady, inconsistent, mechanically-boring and the only positive thing I can say about it, is that the few cultural tidbits are halfway decent. This looks like a “First module you run, ever, as a DM”-type of module, but for that, it’s too opaque and does not do a good enough job challenging all players and making them feel important – only the strongest PC, the Blacksmith, truly has any connection. Fun fact: Strength has, counter-intuitively, NOTHING to do with being a blacksmith in rules – Craft would be the skill, so strong PCs sans the skill make NO SENSE for that. This module is a sore spot in the whole anthology – it does not fit the premise, fails as gazetteer, module AND introduction for novice GMs. It’s horrible and drags the whole book down a small notch and I can’t fathom how it got included herein. Thankfully, Casey W. Christofferson and Scott Greene’s “Irtep’s Dish,” for characters level 6 – 8, is a return to full-blown, awesome form – and I mean AWESOME, as in, glorious- situated in a city (Bard’s Gate in the Lost Lands), this begins with an investigation of an eccentric wizard gone missing – a wizard who was not only smart, he also had a gambling issue. In an interesting blend of fantasy and noir tropes, investigating his former lover, colleagues and debtors can unearth pretty soon that there are ample people looking for the man – and not all are honest regarding their intentions, with a horrible curse being subtly and cleverly used for the wizard’s downfall. Via this investigation, which brings the PCs to the city’s largest casino (fully mapped), the PCs can get the pieces together to investigate the out-of-bounds wizard’s tower – if they can get past the guards and inside, past the deadly puzzle in the beginning, which is btw. logical and fun. This is only where the fun starts, though – the wizard has retreated via an artifact into a petri-dish like environment and the PCs need to shrink down to microscopic size, battling protozoan orbs, flesh-eating fungi, nematodes and finally release the wizard, convince him to return and get his affairs in order. This section is bizarre, fun and played in an awesome, great way – if I may: If the PCs enjoy their trip into the realms of the microscopic, consider picking up Everyman Gaming’s superb “Microsized Adventures” and keep the options for size-alterations. Oh, and yes, this module is pure awesomeness! As if to apologize for the first module in this set, Matt Finch’s “Perils of Ghostwood Pass”, for PCs level 5 – 7, also hits this absolutely stellar tone in a completely different way: Potentially fitting into any cold pass-region, the Ghostwood Pass is a storied environment – here, legendary twins only recently defeated a powerful and nasty fey of the Winter Court, thus banishing the hyper-cold ghostwind to only a few instances per year. As the PCs begin this module, a timer is running – after that, the ghostwind strikes. The issue is that something is thoroughly amiss – the hastily erected Abbey of Saint Kathelyn may provide shelter, as may the local druid, though both do not deal well with another. The two factions also provide unique benefits for the PCs as they try to defeat the dreaded mountain queen – and unearth the truth behind the mysteries of the Ghostwind Pass. In case the above did not provide ample clue – wilderness survival, hexploration in the hostile pass, random encounters – all provided, alongside a cleverly entrenched mystery astute PCs can unearth. This module is SUPERB and would coincidentally fit really well in the context of Northlands with some minor reskinning. Oh, and the adversary build rank among the more challenging and well-crafted herein, which coincidentally provides a lead-in to the last triumvirate of modules. This would be the updates of “Vampires and Liches,” with Casey W. Christofferson and Bill Webb’s “Sewers of the Underguild” for 11th level characters being the first – the premise of which is pretty simple: In a rather deadly sewer under ruins or a metropolis lies the hiding place of a guild of vampires. Exterminate them. This sounds simple, when it is anything but simple – the underguild were formidable foes, with numerous class levels, deadly traps and the like. Alas, here, the conversion somewhat botched – with vampires as a type being rather nerfed in PFRPG, and the increased options available for characters via classes and combinations has not been realized to them same extent as in the original version – essentially, the adversaries are a tad bit squishier, the module has lost some of its threat. Mind you, this still is a challenging module, sure, but it does not live up to its previous iteration’s level of lethality. If you don’t know the original, you probably won’t wind, but this can also be seen in the next module, penned by the same duo. “The Pyramid of Amra”, for 12th level characters, pits the PCs against a monastery in the hands of lethal adversaries and finally, against a vampire-monk. The exploration of the areas herein is thoroughly compelling and lends itself well to the insertion of powerful adversaries and intriguing puzzles. And indeed, the final adversary *is* still deadly; however, I still found myself wishing the builds provided had been changed in a slightly more pronounced manner. The final adventure, “Isle of Eliphaz”, intended for characters of at least 14th level, is still LETHAL – while, when I ran the module, I made the whole place a selectively null magics/psionics zone, thus rendering it even worse, the base module already is brutal – exceedingly brutal. And, in fact, here e.g. the intellect devourer with class levels and the ancient, elemental evil’s pathfinder iteration maintain the level of deadly challenge I enjoy from this series. Editing and formatting are good, though not perfect – in some of the older modules, references here and there remain and some of the previously unreleased, older modules feel a tad bit less refined than others, with unique benefits particularly not always perfectly syncing up with rules-language. Layout adheres to a printer-friendly two-column b/w-standard with copious, original & glorious b/w-artworks. The maps generally are well-drawn, though I wished the book had a player-friendly appendix of unkeyed maps for particularly the hexcrawl-sections. 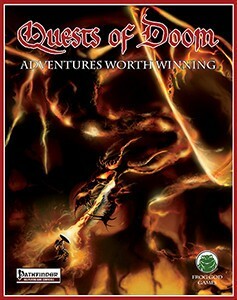 Scott Greene, J. Collura, Matt Finch, Clark Peterson, Bill Webb, Michael Curtis, Skip Williams, James M. Ward, Ed Greenwood,, Casey W. Cristofferson, Steven Winter – these names should ring a bell and indeed, Quests of Doom, as a whole, manages to achieve the goal to create challenging, unique modules. While a couple of the modules did fall a bit short of the stellar quality established by the rest and while some do require a bit of GM fiddling, in the end, this book does contain several modules that simply blow me away – the whole “Bugs & Blobs”-chapter is pure gold, and, with the exception of “Deep in the Vale”, “Men & Monstrosities” provides two of the most awesome modules herein. “Lycanthropes & Elementals” falls short of the average quality of the book, ranking in as “only” a solid/good chapter. Still, that leaves a total of 6 modules herein, 9 if you include the conversions, that would receive my seal of approval without a single inch of hesitation. Indeed, I maintain that the stellar modules herein outweigh the minor rough edges AND the modules that do not reach the apex of quality and imagination. “Of Ants & Men”, “Hidden Oasis & Temple of Thoth”, “The Dead From Above”, “Irtep’s Dish” and “Perils of Ghostwind Pass” alone are worth the asking price of this module – and these are the exceptional, NEW modules herein. The rest averages at a very good to good, with only “Deep in the Vale” being what I’d consider a bad module. To put that in perspective – that’s 13 pages. You still get so many awesome modules herein, that I cannot, in good faith, rate this lower than 5 stars – especially since the exceptional modules listed above absolutely deserve this rating and nothing below. 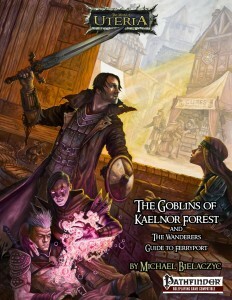 You can get this massive book here on d20pfsrd.com’s shop! Prefer Old-school? Here’s the S&W-version on d20pfsrd.com’s shop! Quests of Doom (5th edition) Part I links: D20pfsrd.com’s shop. Quests of Doom (5th edition) Part II links: D20pfsrd.com’s shop. Finally, Frog God Games is currently running a kickstarter for the Northlands Saga, a massive level 1- 20 Viking AP – check it out here! If you’re a 5th edition fan, you may want to know about their crowdfunding of Quests of Doom 2 here on the FGG-site! This module/sourcebook-combo clocks in at 73 pages, 1 page front cover, 1 page editorial, 1 page ToC, 1 page SRD, 1 page advertisement,1 page back cover, leaving us with 67 pages of content, so let’s take a look! Now this can be very much considered to be a combo module/sourcebook and as such, the following review will contain SPOILERS. Potential players should jump to the designated end of the SPOILERS, where I will begin commenting on the sourcebook-section. The pdf begins with a general introduction to the world of Uteria, with a map also depicting a part of the continent. The unique component here would be one that is indebted to low/rare-magic games – magic has only recently returned to the gritty world of Uteria and as such, is greeted with mistrust and some trepidation and prejudice. However, much like most good solutions to the mechanical repercussions, the pdf acknowledges the option to explain “magic” weapon abilities as a kind of superior craftmanship. Furthermore, magic works akin to in Dark Sun – i.e., one’s magic can drain the land akin to the concept of defilers or via slow increases. While the Mana-point-based casting is explained in the Elves of Uteria sourcebook, I do believe that this pdf ought to have provided at least an abbreviated section on this spellcasting system, mainly due to one of the pregens being a caster. Each character also has a legacy item, a signature possession which will increase in power over the levels. Among the additional rules provided, there would be so-called horde-rules, which, alas, are not good: Intended to represent overwhelming numbers, I applaud the general notion, though, alas, the rules-language that is employed to convey its limitations falls behind the notion by being more opaque than it ought to be: The base idea is to reward successive attacks versus one target. Alas, the pdf fails to specify when such a bonus actually decreases, if at all. As a nice alternative, I’d suggest using 13th Age’s Escalation Die AGAINST the PCs at all times they are outnumbered for a similar, more elegant way of depicting the threat of being overwhelmed. So, from here on out, there be SPOILERS! A dilapidated tower in the midst of the forest has been made the fortress of some of these odd goblins. The presentation here does some things right and some wrong – I do love that e.g. the combat-relevant stats for e.g. dire rats are provided in an abbreviated form, thus not requiring you to skip books. On the downside, e.g. some traps do not adhere to the proper presentation-standard – while functional, e.g. an easily spotted tripwire does not sport a DC to disable. This does not extend to all traps, mind you, but such instances can be found. Map-wise, both the tower and the caves below it are covered via solid full-color maps, though I wished player-friendly versions had been included in the deal. Speaking of which – the presentation of statblocks also deviated from the established standard in minor ways, so if that type of choice annoys you, that’s something to be aware of. The exploration of the small complex is pretty solid, with acid spitting slugs and the like being interesting creatures to be encountered. The read-aloud text is also rather nice, though ultimately, I was a bit annoyed by the lack of consequence that entails regarding the enemy status: While the first goblin can escape, resulting in a complex that is “alarmed”, there is not really any relevant consequence for the goblin getting away. A slightly more organic set-up could have helped here. On the plus-side, the pregens provided come with advice on how to play them as intended – advice you can easily ignore, should you choose to. Still, nice! Beyond the pages of the module-section, we begin with the main-meat of this book, namely the massive gazetteer-like section of this book that depicts Ferryport (fully mapped) and its surrounding area – between pieces of in-character prose, information on backgrounds and motivations of most movers and shakers (who also come with beautiful b/w-artworks) and the like, we receive a significant array of interesting information. More importantly, the write-ups are truly captivating – with colorful personalities and descriptions drawing you right in, the array of interesting motivations and backdrops providing a LOT of fodder for a DM to use. Speaking of DM – herein, the DM or GM is called SG – story guide. Personally, it irritated me. I won’t hold that against the pdf, but it’s pretty much as annoying as having a cthulhu keeper being referred to as DM. Then again, I might just be overly nitpicky and no, this does not influence my final verdict. If the personalities alone were not enough inspiration for you, then the guilds themselves, also detailed in fluff-only, but captivating prose. Now this pdf does go a step beyond, with some lavishly-rendered locations receiving hand-drawn, functional maps – though I wished the maps had been collated on one page in the end of the pdf – as provided, you’ll have to print out the page and cut out the map. It should be noted that multiple level taverns, inns etc. Alas, you will not see any settlement statblocks or the like herein. Editing and formatting can be considered good, though not perfect, mainly due to some deviations from established formatting standards and some minor hiccups regarding formatting. Layout adheres to a nice full-color 2-column standard. The artwork deserves special mention – there are quite a few GORGEOUS full-color pieces herein, one of which reaches the awesomeness of the cover. Others adhere to different styles (all btw. crediting the artists – nice! ), some recalling old-school style. The pdf also sports some of the most beautiful b/w-artworks I’ve seen in ages – a couple of them are downright evocative. At the same time, though, there are some artworks that look less refined, thus not really providing a unified style – personally, I didn’t mind, though your mileage may vary. Cartography is generally functional, though once again, you will not see a unified style. Unlike the artworks, the maps remain mainly on a functional/okay-level and do not sport player-friendly versions sans keys etc.. Annoyingly, this pdf comes sans bookmarks, thus making navigation more of a hassle than it should be. Michael Bielaczyc, Dane Clark Collins, Shonn Everett – you have generally created a solid first level module with an evocative gazetteer. As written, you may indeed consider me intrigued by Uteria, mainly since it draws upon plenty of concepts near and dear to my heart, with a flair that feels very much down-to-earth and akin to some Ravenloft/Dark Sun-ideas. This seems to have the potential for being a pretty much awesome dark fantasy world and especially the gazetteer-component of this book did captivate me and made me want to read more about the world. The module itself does suffer a bit from the traditional “1st level -vs. goblin-syndrome” in which it simply does not provide a too compelling narrative or theme. That being said, as far as the theme is concerned, this module actually manages to provide a somewhat different spin on the concept – the vermin-association and general presentation help rendering the module component valid. Ultimately, I would have loved more gazetteer – this section is very much fun and compelling, to the point where I wasn’t even galled by the absence of stats for settlements and NPCs. Conversely, I do think the module would have greatly benefited from +10 pages: Further hazards, traps, a less linear set-up ad generally more player-agenda would have made the beginning in particular more interesting. While it plays as a sufficiently fun module, the set-up in the beginning until the PCs hit the adventure-site very much can be considered too railroady and could have used some more things for the PCs to actively do in order to emphasize an illusion of more choice. How to rate this, then? I’m torn. This is a compelling sourcebook and provides some tantalizing glimpses at a world I am excited to learn more about. At the same time, the module itself did not blow me out of the water with its rather conservative make-up and fell quite flat for me. And then, there are the minor hiccups – no bookmarks, problematic wording here and there – one can find quite a few minor deviations from the established rules-language standards. All of this, though, does not detract from the compelling prose. In the end, this module/sourcebook does a lot of things right and has great production values – but it does suffer from quite a few problems and glitches one can see in the work of less experienced publishers and authors. This, however, is not the first offering in the world of Uteria, so alas, no freshman-offering bonus. After much deliberation, I will settle on a final verdict of 3 stars – whether you consider this better ultimately depends what you want: If a fluff-only sourcebook that has some cool food for thought is what you’re going for, this may well be worth it. If you primarily would get this for the module, you probably won’t be that blown away. You can get this module/sourcebook here on OBS. -Attuned to the Wild: When in the selected terrain, triple natural HP recovery rate. +tier to Survival in the chosen terrain. Use mythic power to gain fast healing equal to 1/2 your tier for 1 minute. -Discerning Eye: Increase racial bonus to +3 and also apply it to rolls opposed by Sleight of Hand and Disguise. Use mythic power to reroll a failed check to which the bonus applies. -Elven Battle Training: Increase bonus vs. sunder and disarm to +4, also applying it against steal maneuvers for the listed weapons you’re carrying and to saves that specifically target them. Also, choose one weapon you’re proficient in – gain +2 AC versus attacks made with said weapon. Spend mythic power to extend the latter bonus to all weapons listed for tier rounds. -Elven Spirit: Gain 2 racial traits, including elven magic and ones that are exchanged for elven magic, even providing guidance for lightbringer or spirit of the waters. -Exile’s Path: Think in two languages at once, auto-failing attempts to read your mind unless the target is fluent in common and elven. Also reroll any Will-save, not just enchantments and use it more often via mythic power. Nice one, especially if your campaign is kind of language focused. -Guardian of the Wild: Increase dodge bonus in chosen terrain to +4 and gain +2 to Ref-saves. You can also expend mythic power (here erroneously called mythic tier) to ignore cover or concealment granted by the terrain for mythic tier rounds. -Half-Drow Paragon: Has a minor formatting glitch in the Prereq-line. Use mythic power to use the mythic variants of your racial SPs, also granting them as spells known, if you can cast spells. -Human Spirit: Each level, choose a bonus skill or the favored class bonus for whatever class level chosen. You are not limited to gaining only 4 skill ranks. -Mage of the Wild: Increase bonuses in the attuned terrain to +4. Use mythic power to make AoE-spells in the terrain not hurt animals pants or the terrain. Nice one. -Multitalented Mastery: Also gain favored class bonus in addition to hit point or skill point per level. If you have Elven or Human Spirit, you may select the FCOs of elves or humans instead of those of half-elves. -Neither Elf Nor Human: Use mythic power as a swift action to not be considered humanoid for 1/2 tier rounds. NICE! -Seen and Unseen: +1/2 tier to the bonus provided. If you expend mythic power, elves, humans and half-elves must roll twice to track you and use the worse result for mythic tier rounds, with multiple uses stacking. -Shared Manipulation: Activate as a swift action. When using mythic power as a move action, increase the bonus provided to +3 and apply it to both Bluff and Intimidate checks made by allies for Cha-mod + tier rounds. -Spirit of the Wild: +4 Perception in the chosen terrain, not only in surprise rounds. You can always act in surprise rounds in the terrain chosen and may expend mythic power at the beginning of a battle, surprise round or not, to gain blindsense 30 ft. for tier rounds. Nice sentry/stalker–feat. Editing and formatting are very good, I noticed no rules-impeding glitches. Layout adheres to Legendary Games’ 2-column full color standard and the pdf has no bookmarks, but needs none at this length. Jason Nelson and Jeff Lee’s Elf feats generally are nice and provide logical continuations of the imho rather subpar base feats they’re built on – which also brings me to the one issue here that is pretty pronounced: This time around, the base feats didn’t have much to offer and what was done with them is pretty nice. At the same time, I can’t really bring myself to recommend this one in the highest praises – though especially Neither Elf Nor Human is AWESOME. My final verdict will hence clock in at 4.5 stars, rounded down to 4 for the purpose of this platform – a solid selection of mythic upgrades. This pdf clocks in at 26 pages, 1 page front cover, 1 page editorial, 1.5 pages of SRD, leaving us with 22.5 pages of content, so let’s take a look! Pathfinder Unchained has provided an intriguing array of options regarding variants of base classes, but, as often in a system this inter-dependent and connected, it should come as no surprise that the massive toolkit/modifications that are archetypes would result in some hiccups with these new options – so here we are: Archetypes, made available and functional with the Unchained Monk, so let’s take a look at how Carl Cramér’s take works! The Drunken Master moves Drunken Ki up to 4th level, while drunken strength remains at 5th level -alas, like Everyman Gaming’s take on the unchained archetype, this take also inherits the base archetype’s sloppy nomenclature regarding the differentiation between the temporary drunken ki and the regular ki in the drunken strength ability. Note that this is not a strike against the archetype as presented herein, but rather against the base archetype – though personally, I would have loved to see this fix it. However, the Drunken Master trumps Everyman gaming’s take on the archetype in one crucial way – Drunken Courage, Resilience and Firewater Breath have ALL been made archetype-exclusive ki-powers that you can take or leave. Drunken Courage now is available at 8th level, the DR gained by Drunken Resilience has been carefully increased in its potency and scaling and best of all, firewater breath is available starting 16th level, with damage-dice and save scaling accordingly with class levels, rendering the archetype more customizable than both Everyman Gaming’s rendition of it AND the base archetype – KUDOS!! The Far Strike Monk retains obviously the ranged flurrying capacity, bonus feat-array and first level fast throwing options, with the Shot on the Run modifications scaling at the levels we know from the base archetype. Invisible blade is a bit odd in that it becomes available at 3rd level, but substitutes the still mind gained at 4th level. Ki Missile replaces the style strike gained at 5th level. In a nice adaption, Trick Throw got moved down to 9th level, but at the same time, it does replace 9th, 13th, 15th and 17th level style strikes. The Flowing Monk, as presented herein, maintains the core redirection ability and bonus feat selection. However, in an interesting minor modification, unbalancing counter’s flat-footed exploit can now be mitigated via uncanny dodge, an ability that has seen a continuous devaluation since its inception – thus increasing its value once again. While I like this, I do think that a caveat for higher level monks in relation to lower level opponents being able to bypass this, would have been prudent -as provided, this is a rather situational nerf. Flowing dodge has been changed from being attribute-based in its scaling cap to being capped by level, which imho is more elegant. At the same time, flowing dodge’s relatively small benefits could have used a subsequent upgrade in this iteration, with a minimum of +2 per adversary seeming prudent -after all, the draw at low levels is that Wis-mod tends to result in a relatively lenient cap. Elusive Target does sport a very intriguing mechanic here – replacing 3 style strike abilities – the ability’s damage-negation and strike-redirection has been codified anew in a rather intriguing manner, with the scaling feeling right in ways the base archetype’s did not. The Volley Spell base ability’s issue with identifying the spell cast to be volleyed has been inherited from the base archetype, but the exchange for the 15th level style strike means that it enter play slightly sooner and has a higher chance of being relevant – nice one! Hamatulatsu Masters are represented herein as well – and might offer an issue. I’m not sure whether Hamatulatsu as a term is a closed IP-name or not, so I’d advise the Purple Duck Crew to double-check that. The ki-pool abilities of the Hamatulatsu Master are now gained earlier alongside the ki-pool, though they still replace Still Mind -not sure whether this is thus intended for 3rd level or whether it should be fourth – the ability does not specify Infernal Resiliency is gained at 5th level. Next up would be the Harrow Warden, whose idiot strike remains in effect and Mute Hag Stance gained at 9th as established in the base archetype. However, thereafter, with both Big Sky Stance and Eclipse Strike being redesigned as ki powers – surprisingly, with the former potentially being available as soon as 8th level as opposed to 11th level in the base archetype – interesting choice, though one I can still kind of get behind, in spite of my dislike for the immunities the ability grants in the first place. Once again, I’m not sure whether “Harrow” is closed IP, so rebranding this as “tarot” or something like that may be required. The Hungry Ghost Monk, as envisioned here, retains Punishing Kick as a basic 1st level attack-option, but modifies Steal Ki (gained at 5th level in lieu of purity of body)- the ability now allows for the shaking off of diseases the monk suffers from. Alas, much like Everyman Gaming’s take on the archetype, this one does not deal with the base ability’s failed kitten-test for replenishing a limited resource. The further abilities of the archetype have been redesigned as ki powers, an approach I enjoy, though, alas, much to my chagrin, the base archetype’s kitten-issues haven’t been fixed here either. The Kata Master-archetype has been wholly redesigned – the archetype now has a linear progression of deeds far beyond what the non-unchained variant offered and, indeed, Cha now becomes the governing attribute for AC-bonuses. This decreased MAD over the base archetype does mean that (improved) evasion is replaced with (improved) uncanny dodge and instead of getting a ki-point, the panache-pool can be used to act as ki starting 4th level, in an interesting take also expanding the critical threat range of ki strikes. Furthermore interesting – a total of 6 different deeds are codified as optional ki powers for the kata master to take (or leave) and at 5th level, an Improved Critical applying to every weapon and unarmed strike emphasizes the focus on precise strikes implied by katas. The original kata master is a plug – it can be used to craft some nasty synergy-tricks…which is not bad, but it doesn’t do a good job at representing the concept. This radical redesign is just what the doctor ordered – while a bit crit-centric for my tastes, this redesign actually FEELS like a monk focusing on kata – kudos and two thumbs up for going the extra mile! The Ki Mystic for the Unchained Monk as envisioned here gains the base archetype’s earlier ki-access and mystic insight at 5th level is retained. The latter abilities provided by the base-archetype all have been rewired as archetype-exclusive ki-powers with sensible minimum level requirements – kudos for allowing this flexibility. The Maneuver Master monk’s flurry of maneuvers, as imagined here, still retains a cap on maneuvers to be executed per flurry (unlike Everyman Gaming’s take on the concept), but the cap scales with levels, allowing for up to 3 maneuvers per flurry and thankfully ignoring the base archetype’s penalty to CMB. Maneuver Defense and Meditative Maneuvers can be found at 3rd and 5th level, while the three high-level options once again have been redesigned as archetype-exclusive ki powers – and odd decision in the latter two cases since the abilities have no connection to ki or ki-expenditure. The Martial Artist as envisioned here, retains Pain Points at 3rd level and 4th level nets the usual fighter prereq-trickery and exploit weakness. Obviously, the other abilities, from extreme endurance to the physical resistance-tricks, replace the follow-up ki-powers gained over the levels – a solid take on the concept, though personally, I prefer Everyman gaming’s switch of Exploit Weakness as an active ability to 3rd level. Also odd – the archetype retains Ki Strike, which it can’t use. Monks of the Empty Hand herein are covered in a bit more detail than I would have expected – Catch Off-Guard-interaction is actually explicitly pointed out, while the ki-pool’s bonus abilities are relegated to 4th level and ki weapons being moved to 4th level as well, scaling akin to the base archetype’s ability, replacing a total of 3 ki powers. Solid! Monks of the Four Winds move slow time to 13th level, while Aspect Master and Immortality retain their places at 17th and 20th level, replacing a style strike and the capstone perfect self. While I don’t really like the base archetype, the unchained version still is solid. Monks of the Healing Hand codify all of their healing abilities as ki powers, with level-scaling and availability adhering to sensible principles and the capstone retaining its AoE true resurrection. The Monk of the Lotus as presented here goes beyond the usual -while Touch of Serenity is retained at 1st level, 5th level sees a replacement for the style strike deals nonlethal damage with touch of serenity, rendering the archetype infinitely more feasible – kudos! Level 9 may be a bit beyond – creatures targeted by touch of serenity may only move or talk – yes, this actually allows you to lock down foes and come to nonlethal resolutions. Touch of Surrender and Touch of Peace replace the respective style strikes at 13th and 15th level, with learned master retaining its position at 17th level – I wholeheartedly enjoy the expansion of this archetype – it renders it more worthwhile and versatile. Kudos! Monks of the Sacred Mountain, as presented here have Bastion Stance, gained at 3rd level, codified anew as a more flexible scaling that improves at 9th and 15th level – this minor modification is nice, though I’m still not sold on the base archetype’s sacrifice of evasion and its improved brother for the relative paltry benefits it nets, but that’s not something I should fault the unchained-conversion here, for – the scaling in the otherwise very strong bastion stance already is a step in the right direction in my book. The Monk of the Seven Winds retains Lightning Finish and replaces the 5th level style strike with Endurance – bland. 9th level locks you in Defensive Spin as style strike choice and 17th level locks you into Flying Kick and Sirocco Fury is gained at 13th level, replacing the 13th and 15th style strikes – though I wished this got the italicization of duplicated SPs right. Carl Cramér’s interpretation of the Unchained Sohei allows for flurry of blow with non-monk weapons and retains the stunted cap of unarmed strike damage. Monastic Mount’s benefits are gained at 3rd level and eliminated fast movement, with Ki Weapon being paid for by the stunted unarmed damage growth and gained at 4th level. Weapon Training is gained at 5th level. I like the expanded benefits the new scaling offers and the slight change of focus here. Spirit Master monks move Spirit Combat to 2nd level (GOOD decision – sooner, active signature ability!) replacing evasion instead of the base archetype’s maneuver training, while resilient soul remains at 3rd level, though it still replaces still mind, which is situated at 4th level. Diamond Strike is kept at 5th level and replaces the style strike there instead of the base archetype’s purity of body. To offset this slight power-gain, the archetype moves Spirit Burst to two levels later, to 9th level, where it consumes the style strike gained there. At 11th level, Carl Cramér introduces a new ability – Stalwart. This is mettle (i.e. evasion for Fort- and Will-saves) by another name and constitutes one of my pet-peeves. I always hated this ability in all of its guises, but I have to grudgingly admit to being somewhat okay with it at this high a level…and it replaces improved evasion, so at least the archetype does not become an omni-saving monster. So yeah, a grudging “kudos” from yours truly. Spirit Flow is moved down to 13th level, which, in spite of the massive 6-level-jump, makes sense to me, as the original archetype’s level 19 is too late for the ability to do much. Purifying palm remains at 15th level and the original archetype’s capstone now is moved to 17th level – in case you’ve been watching carefully – yes, these replace the style strikes. The Tetori, as one archetype that does not translate easily to the Unchained monk, receives a massive overhaul that completely rewires the archetype – essentially, we have a replacement of all ki-powers with tetori grappling techniques. I generally like the notion here, though I do consider Alexander Augunas’ move of graceful grappling to 1st level more than the delay of tetori tricks featured here. On the plus-side, high-level constrict is a cool idea, though a glitch calls Iron Body constrict as well. All in all, a solid take on a difficult conversion. Next would be Carl Cramér’s Terra-cotta Monk – whose Trap Intuition receives an upgrade – it now only eats the second level bonus feat instead of evasion. Stone Grip paid for at 5th level with the style strike and trap dodge replaces the style strike at 9th level. Conversely, Sudden Adit replaces the one at 13th level, Petrifying Strike replaces the style strike at 15th level and rainmaker eats the style strike at 17th level. This one changes the base archetype in quite interesting ways – it gets rid of the non-sense loss of evasion of the base archetype, which I never got in the first place, so kudos there -I think this iteration does the concept better justice than the base archetype. This pdf’s take on the unchained Wildcat gets Improvised Weapon Mastery at first level, once again with Catch-off Guard caveat. The ability-distribution and payout of gained abilities versus ki-powers substituted make this a generally interesting one, though the ability-replacement forgot the 4th level ki power, which is obviously useless sans the ki-pool that is eaten by Brawler Maneuver Training. On a nitpicky tangent, one could also complain about the absence of ki strike being replaced, but that depends ultimately on whether you consider that a part of ki-pool or not. Okay, so here we go – the Zen-Archer: The ranged Flurry of Blows gets the very first much needed caveat – a prohibition on combination with Manyshot and Rapid Shot -KUDOS!! In case you’re not guessing this by now – the archetype spans almost two pages in its iteration herein – and has been massively redesigned. Let’s e.g. take a look at Perfect Strike- still gained at first level, obviously, but at higher levels, the Zen Archer may expend ki to use the unarmed damage dice-size for her arrows – yes, that’s up to 2d10. Furthermore, 12th level allows for Perfect Strike arrows to be rolled THRICE and take the highest result – yup, moved up two levels. 16th level lets them act as ki-focus….It#s the evil damage-output… The base archetype features for a reason in A LOT of evil builds and while the prohibition on multi-arrow-firing does take a bit of oomph away, this still is nasty. That being said, the dispersal of abilities and scaling at least means that the character has a good reason to keep leveling in the class. And 5th level and every 4 levels thereafter nets my favorite component of this archetype – so-called Style Shots. Completely new, these allow you to temporarily stagger foes, cover allies etc. – with higher levels allowing you to execute more Style Shots per round, with this ability replacing style strikes. Trick shot is moved to 13th level and, in an interesting decision, some monk class features lost can be taken as ki-powers. I do not think this archetype fits into all groups – it can be pretty nasty regarding its output – but at the same time, it is an infinitely better take on the concept than the base archetype, being more distinct and, with the focus on Perfect Strike, closer to the serenity implied by Zen Archery. The pdf also covers some racial archetypes, the first of which would be the contemplative, whose awaken divinity ability remains at 1st level and spurn tradition can still be found here. Know the Unseen Disciples has been moved to 9th level, where it replaces improved evasion. The Gray Disciple’s fade from sight remains situated at 4th level, but all other spell-like abilities, including the earth gliding, entombing, etc., all have been redesigned as ki-powers, with earthen thrall being reduced minimum-level wise to 16th level to act as a potential alternate cap-stoney-high-level option that renders the archetype pretty flexible – I really like this modularity that allows you to customize the archetype beyond the non-unchained version’s linearity. The Ironskin Monk Hobgoblin archetype has some odd hiccups – the flurry of blows ability, for example, explicitly states that the archetype can execute it in light armor, when no line of the regular flurry of blows of the unchained monk prevents flurrying in ANY armor. Iron Skin and the bonus feat-list are retained, as is resilience. Ki-pool remains at 4th level and staggering blow at 5th – as a nice note: The DR the archetype can get explicitly stacks with diamond resilience as presented here. Like in Everyman Gaming’s take on the archetype, surefooted is moved down a whole 4 levels to 13th – which may be a bit much for some groups. Catfolk Nimble Guardians are subject to quite a modification in comparison to the base archetype, gaining Cha to AC and CMD and later increasing this bonus, making the archetype more Cha-focused, while also allowing them to substitute Cha for Wis for the purpose of Style-feat prereqs. Defensive Aid is gained at 3rd level and replaces, slightly odd, the 4th level ability still mind, with 5th level netting Defensive Mastery. Now here, thing become interesting – at 10th level, feline guardians do not lose their Dex-bonus to AC versus invisible attackers, nor are they caught flat-footed, as long as they have at least 1 ki point – this is actually great as it a) capitalizes on the trope of superb feline senses and intuition and b) emphasizes the guardian aspect further – a valid trade for the 10th level ki strike. Guardian Feline is gained at 13th level and replaces tongue of sun and the moon. Kudos and two thumbs up! Oread Students of Stone are modified in that they no longer gain a bonus versus crit confirmation, but instead light fortification – interesting! Strength of Stone has also been significantly rewired, allowing for the gaining of scaling, ki-powered DR – kudos for rewiring Strength of the Stone thus! With Bones of Stone obviously thus rewired in the previous ability, the further upgrades replace improved evasion with better fortification, while 13th level nets soul of stone and 20th level keeping the capstone. The rewired DR makes the archetype more feasible – nice one! The Vanara Treetop Monk has, oddly, Branch Runner mixed into Wood Affinity, though this part of the scaling ability is moved down to 3rd level, while freedom of movement replaces tongue of the sun and the moon at 13th level. A solid take on the archetype. The Underfoot Adept’s Underfoot Grace here has been redesigned…alas, here applies “If it ain’t broken…” – the ability as presented scales your effective size, which is a good idea, but getting rid of the scaling of the base ability and granting level 1 full speed Acrobatics through threatened areas is pretty nasty and means that dipping into this archetype is MUCH too tempting. I really don’t understand why the base archetype’s sensible anti-dip scaling was done away here. The Human Wanderer retains Far Traveler and long Walk, but oddly, the latter replaces still mind as gained at 4th level, not 3rd. 5th level nets Inscrutable, which oddly has been mixed with Light Step – an odd decision here – doubly so, since the ability is (EX/SP), when both base abilities are SU and obviously, the benefits are more mystical than mundane and the ki-powered SPs are obviously just that, something I never got in the original abilities. Still, a tad bit odd. Finally, the Disappear Unnoticed and Free Step abilities have been moved to 17th and 19th levels, delaying their acquisition significantly. Over all, a nerf I’m not sure the archetype required. Editing and formatting are very good -while I noticed some very minor hiccups, the Purple Duck crew did a good job here. Layout adheres to a printer-friendly two-column b/w-standard and the pdf has no art but the cover, but needs none – I’d always take content over bling. The pdf comes fully bookmarked for your convenience. When I saw this pdf, I wasn’t particularly excited – checking unchained archetypes for consistency is a horrible pain in the behind and takes FOREVER. Furthermore, Alexander Augunas, one of the most reliably good designers of complex crunch out there has already taken the concepts and covered the archetypes. So no, I did not look forward to Carl Cramér’s archetype-conversions herein. Well, I should have. While I won’t lie – this review was grueling to write and research – the content here is very, very interesting. What do I mean by that? The design-philosophy utilized herein differed from Alexander’s in some key aspects. Everyman Gaming’s Unchained Archetypes have opted for a very conservative paradigm, to which the individual archetypes are subjected. Subsequently, though, Alex genius as a designer did not have its usual space to shine, only breaking through when abilities required a radical rewiring. This pdf, in comparison, did not establish a paradigm – instead, one can see how each archetype was hand-crafted and, when required, significantly modified to fit with Pathfinder Unchained. The intriguing part here is quite frankly this courage to play with the archetypes – to move abilities around -and to make some boring, linear archetypes more modular by codifying their class features as ki-powers, thus allowing players to select or ignore them. This level of choice, which the original archetypes did not provide, does result in overall more valid, more fluid designs and potential character concepts. At the same time, a greater willingness to take risks obviously also translated into some minor hiccups I’m not 100% sold on and a less streamlined experience. If a 3rd level ability replacing a 4th level one via the application of an archetype annoys you on a design-aesthetic level, this pdf does sport cases like them. Personally, I don’t mind much and instead enjoy the fact that the lack of a paradigm was translated into a higher playfulness with style strike-replacements and similar modifications of the base archetypes. 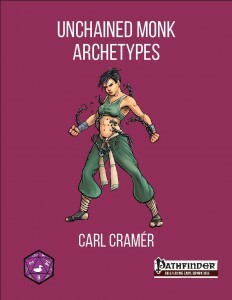 In fact, several of base monk archetypes I have always loathed, have simply a BETTER feel in Carl Cramér’s Unchained take on them – most of the time, the archetypes now better represent the intent of their concept – and that is something that’s worth a lot to me, something that does mitigate some of my more nitpicky complaints. To cut a long ramble short – this pdf is MUCH better than anticipated, and personally, I actually even prefer it over the more streamlined approach of Everyman Gaming. If you’re an experienced GM, you’ll probably enjoy this pdf a tad bit more due to the ability to iron out decisions you don’t like and the more variable frame-work. If you prefer a holistic, unified feel, Everyman Gaming’s two pdfs may be more to your liking. But I’m rambling. My final verdict for this pdf will clock in at 4.5 stars, rounded down to 4 by a margin – kudos for a job done beyond what’s expected and going the extra design-mile! You can get this massive, inexpensive collection of archetype-conversions here on OBS and here on d20pfsrd.com’s shop! 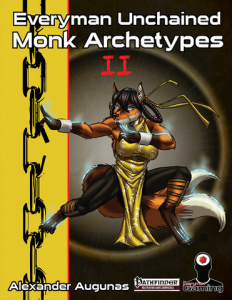 The second pdf by Everyman Gaming that covers Unchained variants of archetypes for the monk clocks in at 10 pages, 1 page front cover, 1 page editorial, 1 page SRD, leaving us with 7 pages of content, so let’s take a look, shall we? As in the first installment of this series, we begin this pdf with an extremely useful piece of information beyond the introduction – the sidebar on cracking the code depicts the extrapolation and abstraction of unchained archetype replacements as used in this supplement and can thus be considered an intriguing piece of information for designers and hassled GMs seeking to adapt unchained archetypes. This useful piece of information out of the way, let#s dive into the respective archetypes! The first monk herein would be the dwarven Contemplative, whose awaken divinity ability remains at first level and spurn the tradition remains available as well. the ability to use ki to power see invisible via Ki has been moved from 7th level to 8th, where it replaces the ki-power. Alexander Augunas’ take on the Far Strike Monk obviously retains the low level ranged flurry and Fast Thrower, but moves the ki pool down to 3rd level, while Invisible Blade can be found at 4th level, where it continues to replace still mind. At 5th level, ki missile remains unchanged and Trick Throw now can be found at 12th level, where it replaces the ki-power gained there. Nice take on the archetype! Next would be the Hamatulatsu Master, here called Golden Devil Master to avoid infringing on Paizo-IP, with the signature feat thankfully also being provided here. The unchained archetype gets infernal resilience at 5th level and moves ki pool to third in accordance with the base class. A minor modification -solid. The Harrow Warden is represented as the Tarot Warden retaining Idiot Strike and Mute Hag Stance at their respective levels, with the two high level abilities being moved down one level to replace diamond body at 12th level and the 16th level ki-power, respectively, making this one feel slightly nerfed, though obviously Idiot Strike benefits from the unchained monk’s better BAB. Now here’s a goody for fans of Everyman Gaming’s superb racial source-books: the Kitsune Kyuubi Visionary can be found herein in an unchained variant! Bonus feats and the Evoke Ki ability of these multi-tailed monks remain unchanged, Magical Fist, however, is changed – gone is the -2 penalty for flurrying with touch-requiring spell-like abilities due to the change of how flurry of blows works, instead providing a solid, nice new wording – though at the cost of the 8th-level ki-power. (Yes, this means one level later than for the base monk’s version.) The 12th level Mystic Recall sports an unfortunate glitch – it replaces abundant step, which the unchained monk no longer automatically gets – hence, it should probably replace the 12th level ki-power. Fans of the no less inspired Samsaran Compendium will rejoice at seeing a conversion of the Samsaran Monk of a Million Lives. These guys retain the signature Zen Trance that replaces flurry of blows and ki pool is moved down to 3rd level according to the unchained monk’s paradigm. Past Life Skills is less costly for the unchained monk – instead of maneuver training, the unchained monk only loses +10 ft. movement rate for this ability. Many Lives retains its place and form. Wholeness of Spirit and Hasten the Cycle now hit at 8th and 12th level, replacing the respective ki-powers, while the high-level abilities remain unchanged. Alexander Augunas’ Monk of the Seven Winds (oddly called Monks of the Seven Forms here – I can’t imagine that being an IP-case, or am I wrong?) are pretty straightforward: Lightning Finish is retained, while endurance at 3rd level now replaces the +10 ft. movement rate. Sirocco Fury is moved down one level to the 12th and there replaces the ki-power as well as the one gained at 16th to account for the upgrade the ability receives there – solid, nothing to complain about, though I’m still not a fan of this archetype. Spirit Strike monks move spirit combat to 3rd level (smart decision – sooner access to the archetype’s signature trick makes sense!) and interestingly replaces fast movement +10 feet. Resilient Soul remains at 4th level and Diamond Soul is retained at 5th level. Spirit Burst was moved down a level to the 8th to replace the ki-power gained there and both Purifying Palm and Spirit Flow conversely replace ki-powers one level beyond their initial archetype’s set-up. Personally, I prefer Carl Cramér’s more pronounced re-assignment of archetype features here. The final archetype herein would be the Terra-cotta Monk, which retains Trap Intuition and substitutes that for evasion, with Trap Dodge being moved down to 9th level replacing improved evasion there. Stone Grip now is gained at 6th level and replaces the Stone Grip gained there and Sudden Adit replacing the 12th level ki-power. Petrifying Strike is moved down a level to 16th and 18th level nets Rainmaker, moving that one down by a level, replacing the respective ki-powers. Nice maintained power, in spite of the moving around of pieces. Editing and formatting are very good, I did not notice an undue amount of issues. Layout adheres to Everyman Gaming’s two-column full-color standard and the pdf actually sports unique artworks crafted by Jacob Blackmon – obviously, kitsune. 😉 The pdf provides bookmarks, but oddly not for every archetype herein – strange. Alexander Augunas’ second pdf covering Unchained monk archetypes follows in the footsteps of its predecessor – it utilizes the solid paradigm established and follows through with trademark ease, tackling, if writing this review was any inclination, a long and tedious work in a way that makes it seem effortless. The inclusion of Everyman Gaming’s racial archetypes definitely constituted an interesting and fun inclusion, a practice I would love to see continued – support for established concepts is always nice and helps keep products relevant. This collection of archetypes definitely is solid and achieves what it sets out to do – it is very faithful to the archetypes, changing what must be changed and rendering them functional with Pathfinder Unchained. At the same time, I found myself truly craving more opportunities for Alexander’s unique designs to shine beyond the conversions provided herein. If you’re looking for a more diverse, less streamlined and cohesive, but also more playful take on archetype conversion, you may want to check out Purple Duck Games’ product – it ultimately depends on your personal taste and what you’re looking for. If you’re using one of the archetypes covered herein and Pathfinder Unchained, and especially if you’re using Alex’s racial archetypes, then you definitely need this pdf. My final verdict will clock in at 4 stars for a good, inexpensive pdf that took me ages to complete. You can get these smooth conversions here on OBS and here on d20pfsrd.com’s shop!